Cryosphere Hot / Cold Foot Massager treats plantar fasciitis pain with soothing massage. Designed by a physical therapist, this unique massager provides much-needed relief to those with plantar fasciitis, heel spurs and aching feet. The secret is the innovative shape and knobbly texture. 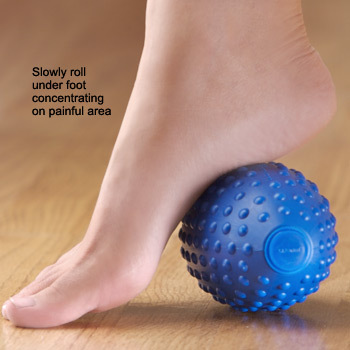 Slowly roll your feet over the sphere for a deep tissue massage, applying pressure where you need it to relieve arch and heel pain. Warm up or chill the massager for soothing hot / cold therapy.